I read Kwame Alexander's book The Crossover when it won the Newbery Award and immediately knew that I'd read all of his books. It was fun, devastating, and beautifully written. Booked is very much the same. 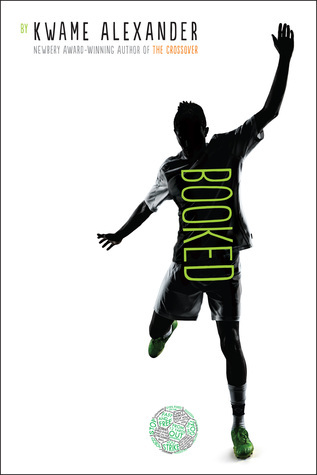 Booked will appeal to middle grade boys who love sports and hip hop and especially those who may be reluctant readers. Since it's a novel in verse it reads very quick. I loved the variety in poems. Some seemed like more traditional poetry. Some seemed like the lyrics to a rap. Some were more artful. Some were meant to push the story along. I've never been a big poetry fan, but it's amazing how so few words can convey such depths of emotion. Nick is obsessed with soccer and not as obsessed with reading. Partly because his dad is a professor and assigns him pages of the dictionary to read. I'd bet that's one of those things Nick will be grateful for when he grows up (like parents forcing you to play the piano), and the book makes it clear that Nick already has a greater grasp of unusual vocabulary than most kids his age. I think it sunk in against his will. A lot of this book is based on soccer, since that's Nick's greatest passion. But it's not what stood out for me. The family dynamics were great. It dealt with his parents getting divorced, and Nick's grief and confusion about it. There's also a strong bullying subplot, which is something most kids will deal with at some point. Another favorite part of the book was Nick's teacher Mr. Mac. He's actually not his teacher, but a beloved school librarian. He's a cool guy who wears silly t-shirts and makes up rap lyrics about books. Mr. Mac was a Grammy winning rap producer which ups his legitimacy with the kids. He's dorky cool. I find that Kwame makes these deceptively fun books that really have a lot of sadness in them. Not that the books are depressing, but Kwame doesn't shy away from tackling hard parts of life in a middle grade book. It definitely makes for a beautiful and powerful book. Recommendation: Buy! The type of book you can read multiple times. The vocab that is introduced in the book and the footnotes made me smile throughout the book. So glad you enjoyed this one.